Jaylinn and Cooper have known each other for years; they have loved each other for years. Cooper has always felt the need to protect Jaylinn, so when he wasn't there when she needed him the most, he blames himself. One night can change everything. It can alter the course in which you thought your life was going. Cooper never thought he would be faced with the guilt that he is carrying. Jaylinn on the other hand is trying to move past that awful night, yet it continuously comes back and haunts her. Whether it be in her dreams, or with her relationship with Cooper. Jaylinn has been honest with her feelings for Cooper. She wants to have a relationship with him, more than what they currently have. Yet, Cooper feels as though she deserves better. He feels as though he can not give her what she wants. The two of them know that they love each other, they know how deep their feelings are for each other, but how come Cooper can't take the next step? When Jaylinn realizes that Cooper won't step up to the plate, will she stay? Will Cooper strike out, and lose everything? Will Jaylinn force Cooper's hand? When Cooper is faced to make a decision to be in a relationship with her, or let someone else love her, what will he choose? If Cooper won't love Jaylinn, will he be able to sit on the bench and watch someone else love her? I loved reading this book because I felt the raw emotions that the Cooper and Jaylinn were going through. At times, I felt sick to my stomach seeing the turmoil that the two of them faced. I would yell at my kindle for Cooper to step up, to take a chance, to follow his heart. Jaylinn loved Cooper for who he was. She didn't blame him for what happened to her, so why did Cooper blame himself. Cooper felt as though he somehow let Jaylinn down. That if he would have just paid a little more attention, she would have been safe. But we can never play the would have, could have, should have game. We will lose every time. 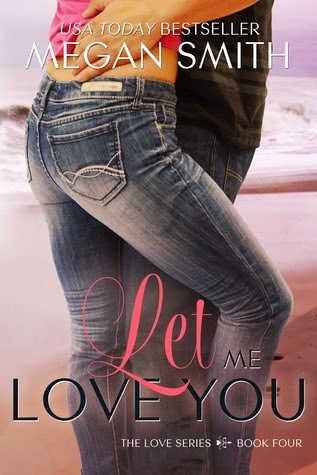 Megan dug deep to get the emotions needed for Let Me Love. She tore our hearts out with each word she put on the page. There are two chapters that stood out the most to me, where I felt the heartache that Jaylinn felt. I felt the guilt that Cooper was feeling. To see the two of the struggle with the heartache tortured me, cause all I wanted was for them to let to love each other. If you have not read the Love Series, then I suggest you ONE CLICK it immediately. You will fall in love with this group of characters.